We Mean Business > 40 D I V E R S I T Y W O M A N Fa l l 2 0 1 7 d i v e r s i t y w o m a n . c o m meetings early in the morning, which became difficult for some employees to attend. Crosby could see it was causing dissatisfaction among team members, but no one wanted to bring it up with the manager. So she suggested using telecon- ferencing for the regular meetings, with in-office meetings once in a while. "Presenting technology as a solution can level the playing field if everyone believes they can participate," she says. "at's the advantage of having a millennial at the table—it's the courage and enthusiasm to have the idea and get it done." Crosby's experience is supported by industry analysis. Gallup concluded in a 2017 report: "Millennials are pushing for change in the world—including in the marketplace and the workplace. ey don't accept 'that's the way it has always been done' as a viable answer. Millennials demand that businesses approach them differently and adjust the customer expe- rience to meet their needs." 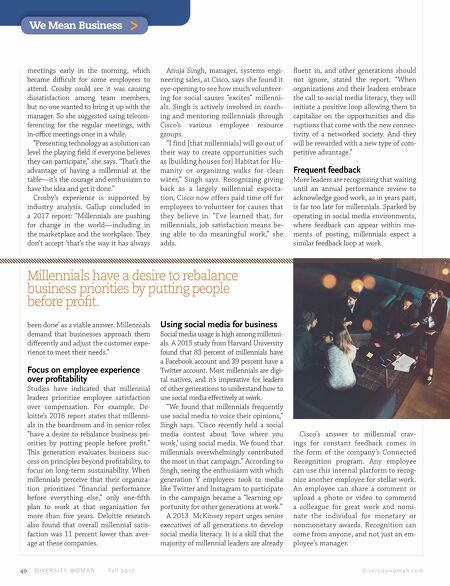 Focus on employee experience over profitability Studies have indicated that millennial leaders prioritize employee satisfaction over compensation. For example, De- loitte's 2016 report states that millenni- als in the boardroom and in senior roles "have a desire to rebalance business pri- orities by putting people before profit." is generation evaluates business suc- cess on principles beyond profitability, to focus on long-term sustainability. When millennials perceive that their organiza- tion prioritizes "financial performance before everything else," only one-fifth plan to work at that organization for more than five years. Deloitte research also found that overall millennial satis- faction was 11 percent lower than aver- age at these companies. Anuja Singh, manager, systems engi- neering sales, at Cisco, says she found it eye-opening to see how much volunteer- ing for social causes "excites" millenni- als. Singh is actively involved in coach- ing and mentoring millennials through Cisco's various employee resource groups. "I find [that millennials] will go out of their way to create opportunities such as [building houses for] Habitat for Hu- manity or organizing walks for clean water," Singh says. Recognizing giving back as a largely millennial expecta- tion, Cisco now offers paid time off for employees to volunteer for causes that they believe in. "I've learned that, for millennials, job satisfaction means be- ing able to do meaningful work," she adds. Using social media for business Social media usage is high among millenni- als. A 2015 study from Harvard University found that 83 percent of millennials have a Facebook account and 39 percent have a Twitter account. Most millennials are digi- tal natives, and it's imperative for leaders of other generations to understand how to use social media effectively at work. "We found that millennials frequently use social media to voice their opinions," Singh says. "Cisco recently held a social media contest about 'love where you work,' using social media. We found that millennials overwhelmingly contributed the most in that campaign." According to Singh, seeing the enthusiasm with which generation Y employees took to media like Twitter and Instagram to participate in the campaign became a "learning op- portunity for other generations at work." A 2013 McKinsey report urges senior executives of all generations to develop social media literacy. It is a skill that the majority of millennial leaders are already fluent in, and other generations should not ignore, stated the report. "When organizations and their leaders embrace the call to social media literacy, they will initiate a positive loop allowing them to capitalize on the opportunities and dis- ruptions that come with the new connec- tivity of a networked society. And they will be rewarded with a new type of com- petitive advantage." 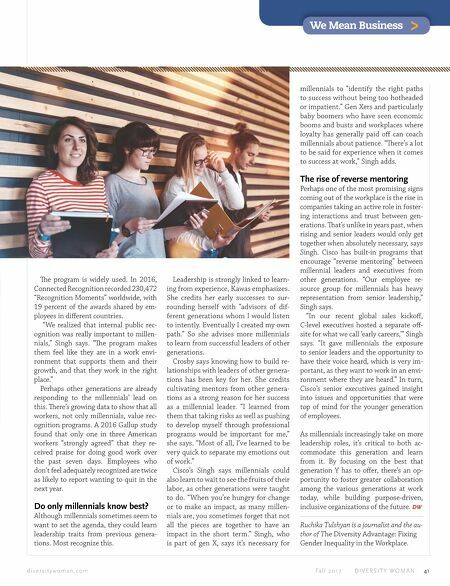 Frequent feedback More leaders are recognizing that waiting until an annual performance review to acknowledge good work, as in years past, is far too late for millennials. Sparked by operating in social media environments, where feedback can appear within mo- ments of posting, millennials expect a similar feedback loop at work. Cisco's answer to millennial crav- ings for constant feedback comes in the form of the company's Connected Recognition program. Any employee can use this internal platform to recog- nize another employee for stellar work. An employee can share a comment or upload a photo or video to commend a colleague for great work and nomi- nate the individual for monetary or nonmonetary awards. Recognition can come from anyone, and not just an em- ployee's manager. Millennials have a desire to rebalance business priorities by putting people before profit.